Happy Monday! Kick starting the week with a couple of Australia Day face painting tutorials. Jessika the face painting, balloon twisting party entertainer from Party Piecez located in Fairfield, Sydney is sharing some of her face painting secrets with us. 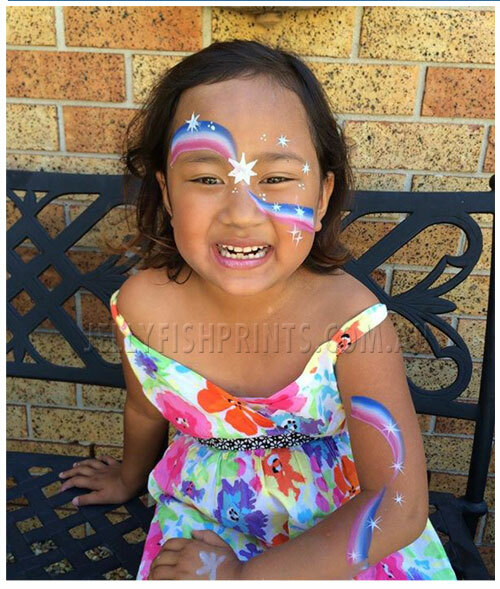 She has created a couple of true blue face painting designs especially for Jellyfish Prints just in time for Australia Day. The first design that we’ll be sharing today is inspired by the Australian Flag. It’s just not Australia Day with out the flag now is it. Lay the brush on an angle and sweep the brush over one eye down toward the nose to make a wavy line. Create a mirror image of the wavy line on the opposite side of the face below the eye. Start from just below the ear. Take your round brush, load it with white paint and create a 7 pointed star in between the eyes. Paint 5 or so more 7 point stars along the wavy line and around the eyes. Vary the size for each star. Paint little groups of 3 different sized dots around the design and eyes. Add 1 or 2 star clusters as well. You can replicate this same design on the upper arm as you can see in the picture below. So there you have it. 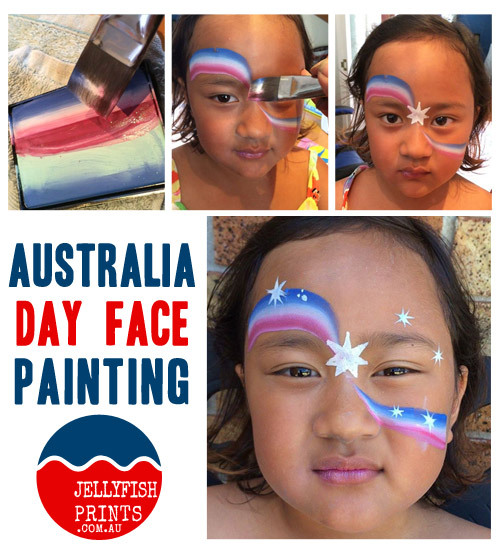 A simple and effective face painting design to wear this Australia Day weekend. We’ll be sharing the Koala bear tutorial tomorrow so be sure to check back with us then. Thank you so much Jessika for sharing your artistic talents with us. You can find out more about Jessika and the Party Piecez party entertainment crew and how they can help you to keep the kiddies entertained at your next children’s birthday party celebration.